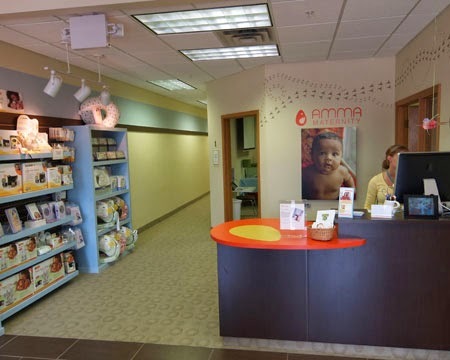 Amma Parenting Center in Edina is a one-stop shop that offers classes, support groups and baby products for new and expectant parents. However, in its previous life, the space housed an insurance company. Thanks to The Foundation Architects, this former office space is now a space for engagement and education. To better utilize the space, The Foundation Architects added another classroom to turn it into a three-classroom center, decreased office space in order to expand the retail area, and incorporated Amma’s brand into the architecture by making a customized desk in the reception/cashier area with the company’s logo. The center exudes a friendly, calm and cheerful vibe—exactly what the doctor ordered. The design incorporates Amma's logo and brand. Amma Parenting Center provides a colorful and fun retail experience. Finish and color selections enhance the friendly feel of the space.